List of UAE airports - international and other airports in the UAE. List of airlines flying to UAE - includes list of air travel services agreements between UAE and other countries. Abu Dhabi budget airline - maybe one day, speculation only so far, no confirmed plans reported as of January 2010. Air Arabia - budget airline based at Sharjah International Airport, also hubs in Egypt, Jordan, and Morocco. Air Dubai - sounds like an obvious name for an airline based in Dubai but isn't. It's a music group based in Denver, Colorado, USA. Arabjet, Dubai - premium only airline, start date of flights planned for 2009 but delayed ... Rumours in 2008 said Arabjet might takeover the cancelled SilverJet operations but nothing eventuated. Al Hajar Airlines (Al Hajjar Air) - new airline company scheduled to start operations from Fujairah Airport in 2012. Eagles Aviation Management, RAK Free Trade Zone - charter flights? Eastern Express - new name for Al Hajar Airlines based out of Fujairah International Airport. Elite Aviation - based in Abu Dhabi, flights planned for Baghdad and Erbil in Iraq in 2010 pending receiving a UAE Air Operator Certificate from the GCAA. President is Khalid al Hashemi. Fleet consists of 2 Airbus A320s and a Boeing 737. Was operating flights from 2009 for Blue Wings based in Germany. Pluto Airlines, Sharjah - announced in 2002 but didn't take off, so to speak. RAK Airways - based at Ras Al Khaimah International Airport (operations suspended in 2009? Restarted October 2010). Rotana Jet - domestic flights in the UAE and executive charter operations, based in Abu Dhabi (Rotana Jet Aviation). Seawings Dubai Tours - seaplane tours of Dubai - see Seawings entry under private airlines heading. Silverjet - based in the UK but first flights were to Dubai, an all business class flight that started operations in 2007 and went out of business in 2008. The Dubai-based Arabjet was rumoured to be interested in taking over Silverjet operations in 2008 but nothing came of it. In October 2010, relations between Canada and the UAE started to turn sour when the UAE complained about the continuing restrictions on landing rights for Emirates and Etihad airlines at Canadian airports. At the same time, Canadian personnel had to leave the Camp Mirage military base in Dubai. In January 2011, visa restrictions were imposed on Canadian citizens visiting the UAE. Abu Dhabi Aviation, Abu Dhabi - helicopter and fixed wing aircraft operations, servicing oil rigs in the Arabian Gulf. Aerovista Aviation, Dubai and Sharjah. Air Charter Service - international private jet charter with offices worldwide. Dubai office is Air Charter Service FZ Co, Dubai Airport Free Zone, West Wing Building 4WB/241, PO Box 293696, Dubai, UAE, tel +971-4-2149200 or +971-4-2149222 (24 hrs), fax +971-4-2045086, email sales@acsfzco.ae. Al Jaber Aviation (Al Jabar Aviation) (AJA), Abu Dhabi - private executive jets. AVE.com, Sharjah - charter and lease aircraft, previously known as Phoenix Aviation? Bue Star Jets - based in New York, USA but has an office in Dubai (and several other locations worldwide). Dolphin Air, Dubai - charter airline. Dubai Royal Air Wing (Dubai AirWing) - airline for the Dubai Government. Eastern SkyJets (Eastern Sky Jets), Dubai - charter airline. ExecuJet Middle East - ExecuJet is based in Switzerland but has a Fixed Base Operation (FBO) and maintenance facility at Dubai International Airport. Falcon Aviation Services (FAS), Abu Dhabi - carter, corporate, executive, tourists flights in fixed-wing aircraft and helicopters. Probably not related to another Falcon Aviation Services that is part of the Falcon Aviation Group registered in the British Virgin Islands? Palm Aviation, Dubai - charter jets and aviation services. Phoenix Aviation, Sharjah - no longer in operation, rebranded as AVE.com? Website domain www.phoenixuae.com is spam. Royal Jet Group - based at Abu Dhabi VIP airport terminal, operates Boeing Business Jets, Gulfstream 300 planes, Gulfstream IVSP, Learjet 60. Royal Jet operations and divisions include Royal Jet Charter Brokerage, Royal Jet Medical Evacuation Service. President and CEO is Shane O'Hare. Tel +971-2-5051500 (24 hrs), or +971-2-5757000, email sales@royaljetgroup.com. Operates in Saudi Arabia in partnership with Arabasco out of Jeddah and Riyadh. Seawings - operates tourist and scenic flights around Dubai with seaplanes taking off from the Port Rashid Cruise Terminal, Dubai Creek, or Jebel Ali Golf Resort and Spa. Also to Abu Dhabi. Skylink Arabia (SKA Air & Logistics), Dubai - charter airline, aviation logistics and services. Western Aviation, Dubai - charter flights and aviation services. Presumably not related to Western Aviation based in Texas, USA? Kinshasa Airways, Sharjah - no contact information or website found, not currently operating? Midex Airlines, Al Ain - subsidiary of Midex International Group. Offices also in Dubai and France. 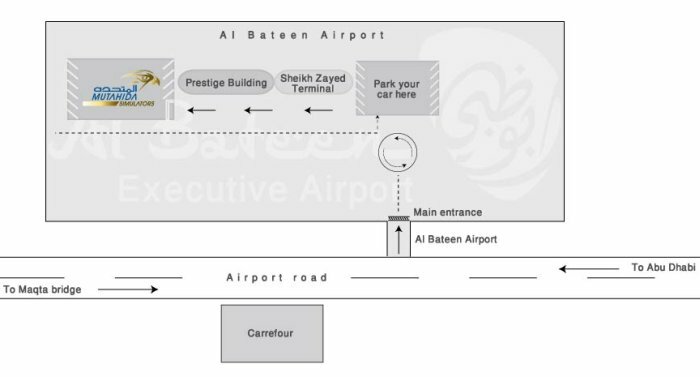 Mutahida Airways (Airlines, Simulators) (not Muttahida) - based in Abu Dhabi, operates an aircraft simulator at Al Bateen Airport where the general public can try being a pilot. Contact tel +971-2-4122222, email info@mutahida.com, website www.mutahida.com, see location map. Ramadan (2011?) flight booking times 1000-1500 and 2200-2400. Abu Dhabi budget airline - headline speculation in Arab News 06 January 2010 based on comment by David J Bentley, Managing Director of Big Pond Aviation (an aviation consultant in the UK and Canada), who said "Abu Dhabi has to compete in the low-cost segment because it is already happening in Dubai and Sharjah". Whether or not Abu Dhabi does that just because Mr Bentley says they have to, remains to be seen. Mr Bentley then goes on to say "There are other smaller airports poised to start competing, such as Al Ain and Fujairah." It's not clear how Mr Bentley comes up with that idea. Al Ain and Fujairah airports themselves probably don't even think they are serious competitors to Abu Dhabi, Dubai, and Sharjah airports. And anyway, Fujairah airport already tried a budget carrier in 2008, Kang Pacific, which barely got off the ground once before closing down again. However, Mr Bentley is probably right in speculating that Abu Dhabi will have a budget airline at some point. Sharjah has one, Dubai has one, so eventually Abu Dhabi will figure it's a good idea too. But it won't be out of the fear that someone in Al Ain or Fujairah will get the jump on them. And as FlyDubai only got started in 2009, a date of 2015 give or take a couple of years seems to be a reasonable guess for when Abu Dhabi might start looking at a locost carrier. As Al Ain is part of the emirate of Abu Dhabi, it seems more likely that there will be an Abu Dhabi budget carrier servicing both Abu Dhabi and Al Ain airports, than a solely Al Ain based budget carrier. Air Arabia - based in Sharjah rather than Dubai, well established and popular, the first UAE budget carrier. FlyDubai - budget airline based in Dubai. Jazeera Airways - a Kuwait based airline that has a base at Dubai airport. Also a bulk sms sending base in Dubai? RAK Airways - not clear if they are a budget airline or not. They're grounded anyway as of March 2009 as far as we know. Last update Saturday 07-Jun-2014. Page development 4L 5C. UAE visas - information about different visa types for entry to Dubai and the UAE. www.abudhabiaviation.com - Abu Dhabi Aviation website. Flash intro May 2014. Previous domain www.adaviation.com is spam May 2014.
www.aerovista.aero - Aerovista website (www.aerovista.net given in some sources not available Jul 2010). Ok May 2014.
www.aircess.com - Air Cess website. Not available May 2014.
www.airchartermideast.ae - Global Air Charter Services Dubai Middle East website. Ok but out of date (2011) May 2014. See also www.aircharterservice.com. www.ajaprivatejets.com - Al Jaber Aviation website. Flash intro May 2014.
www.alraiscargo.net - Al Rais Cargo website. Not available May 2014.
www.arabjet.com - ArabJet website. Not available or no content May 2014.
www.britishgulf.com - British Gulf International Air Cargo website. Under construction July 2010. Forwards to spam website at www4.britishgulf.com May 2014.
www.dolphinair.ae - Dolphin Air website. Ok but out of date (2007) May 2014.
www.easternskyjets.com - Eastern Skyjets website. Flash May 2014.
www.falconaviation.ae - Falcon Aviation website. Ok May 2014.
www.feca.bz - Falcon Aviation Group website. Flash May 2014.
www.flyave.com - AVE.com airline website. Spam May 2014.
www.jupiterairlines.com - Jupiter Airlines website. Ok but out of date (2010) May 2014.
www.maximus.aero - Maximus Air Cargo website, duplicate website at www.maximusaircargo.ae. Flash May 2014.
www.midexairlines.com - Midex Airlines website, www.midexairlines.ae forwards to the .com version, content hosted at midex.glnetwork.org. Ok but out of date (2008-2011) May 2014.
www.palmaviation.aero - Palm Aviation website. No content May 2014.
www.royaljetgroup.com - Royal Jet website. Ok May 2014.
www.seawings.ae - Seawings sea plane tours of Dubai website. Ok May 2014.
www.ska-arabia.com - Skylink Arabia website. Flash May 2014.
www.western-aviation.com - Western Aviation Dubai website. Spam May 2014, delete. Domain www.westernaviation.com is for a different WA, based in USA. www.dubaifaqs.com/airlines-uae.php (PDF and print version).